When James Finley finished high school, he did what so many other 18-year-olds do: he made his way to the Abbey of Gethsemani in Kentucky, where he knew that Thomas Merton was a monk. Finley spent over five years at the monastery, part of that time with Merton as his spiritual director, before leaving at his superiors’ suggestion to continue his formal education. Finley eventually earned a Ph.D. in clinical psychology. Although he never made final vows as a monk, Finley’s practice as a psychologist and retreat leader up to the present day has integrated contemplative practice and insight. 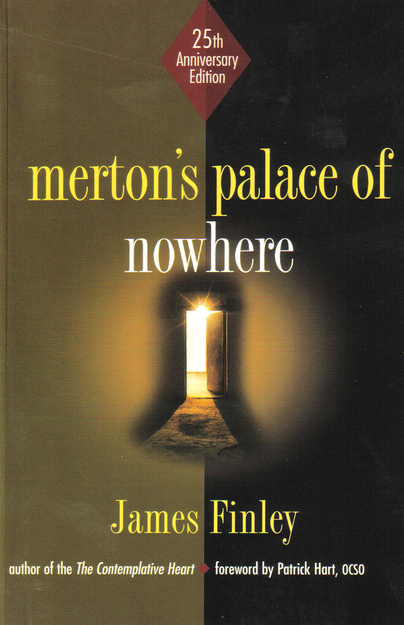 Merton’s Palace of Nowhere is Finley’s most well-known and celebrated book, but he has written others (including The Contemplative Heart, which I reviewed here). The most immediate difference between Merton’s Palace of Nowhere and The Contemplative Heart is that the earlier book is much more Christian, at least overtly. I don’t know if the difference is merely due to different intended audiences or to an author whose views have evolved into a more universal view of contemplative spirituality over time (much as Merton’s did). Reviewed most simply, Merton’s Palace of Nowhere is an excellent book which well deserves its status as a contemporary spiritual classic. Anyone who has benefited from the works of Thomas Merton, and even anyone who has not yet read a word of Merton could gain much for their spiritual life and growth from these pages. In fact, it can be effectively read as an entryway into Merton’s life work. An unborn baby that could think and have its way might choose not to be born. The violent wrenching from its dark, warm world into a horizon beyond its fingertips might seem like a transformation too great to bear. Yet, mercifully, it has no choice. The child finds itself, screaming in protest, flung by the heels into an unfamiliar world. The spiritual life is a kind of birth. In fact, Jesus proclaimed that unless we are born again we will never enter into that life that knows no death. But every birth is a kind of dying. Every new stage of growth calls for a letting go of what went before it. And this letting go hurts. The cross is the source of life yet it pierces us and drains us of the the only life we know. The Father, Jesus said, prunes every fruit tree clean to increase its yield. Prayer unveils our heart, allowing it to be cut by God’s delicate touch. There is no growth in prayer without some degree of exposure to this purification process out of which the true self emerges in its unexpected splendor. This entry was posted in Books, Life, Meditation/Contemplation, Theology, Worship, Writing and tagged james finley, merton's palace of nowhere, the interior castle, true self by tasersedge. Bookmark the permalink.